Every discussion about Bitcoin sooner or later leads to a wrangle over what gives Bitcoin value. Skeptics claim it has no value whatsoever, while believers see it as digital gold with nearly infinite potential. So who is right and what actually makes single Bitcoin valuable? There are several attributes to consider. A brief look at the history of money reveals that as long as people agreed that specific thing had value, then it did. Essentially, it’s faith that makes money work. At first, people used to barter until it became too inconvenient. At that point, they started to trade products for things, like shells and rocks, then gems and rare metals. In recent ages, they were replaced by a government instilled money, that now is the most widely accepted form of currency. As money evolved, it always had the following attributes - fungibility, scarcity, and uncounterfeitability. In addition to that, people have noticed that it’s more convenient to use currencies that are easily portable, stable, and divisible. 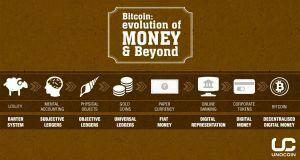 The evolution of money. Source: [URL="https://blog.unocoin.com/bitcoin-evolution-of-money-and-beyond-3bef3552815b" target="_blank"]Onocoin[/URL]. 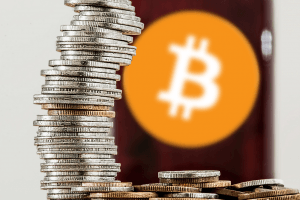 First and foremost, Bitcoin has value due to the same reason the paper and digital cash does – it’s a handy form of money commonly accepted by people. It is used to transfer value and buy or sell things. 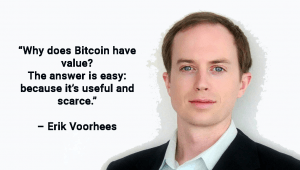 Yet, unlike the US dollars, whose value and legal status are enforced by the government, Bitcoin’s value comes from its code, infrastructure, scarcity, and adoption. Although it’s not tangible, Bitcoin’s code gives it features of traditional fiat currency, including scarcity, divisibility, portability, fungibility, and recognizability. Besides, Bitcoin is decentralized and can be used without middlemen, provides some level of transparency, can be accessed and used by anyone with an internet connection, is impossible to counterfeit and confiscate, and has other features such as programmability. Most importantly, it can be used as a store of value like gold or other commodities, yet unlike its physical counterparts, it can be transported from one end of the world to the other via communication channels in a matter of minutes. Bitcoin scarcity. Unlike traditional fiat currencies that can be inflated without end, Bitcoin introduces digital scarcity. There are going to be only 21 million BTC. Unlike fiat currencies which undergo annual inflation and lose part of its value, Bitcoin’s inflation is limited and controlled. Also, if we counted Bitcoins that are lost for good (send to incorrect, unexisting addresses, or those in wallets whose keys were lost, etc. ), the supply is experiencing deflation which means that there are going to be increasingly fewer Bitcoins available. Divisibility. A single Bitcoin can be divided into 100000000 Satoshis. One Satoshi equals 0.00000001 BTC, the smallest unit of Bitcoin at the moment. This level of division is embedded in Bitcoin’s original code. If there's ever a need, the level of division can be changed into 16 or more decimal places, meaning that Bitcoin offers an infinite degree of divisibility. Portability. 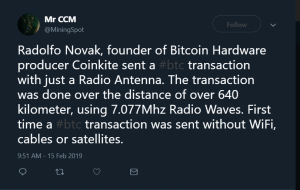 Bitcoins can be transferred through a communication channel like the internet, satellites or even radio waves, which makes it the most transferable currency that ever existed. Bitcoin is the most portable asset ever created. Fungibility. Every Bitcoin has the same value as its counterpart, regardless of who owns it and what history it has. Just like one ounce of pure gold is always equal to another ounce of pure gold. No matter what happens, one Bitcoin remains a symbol of value interchangeable with another Bitcoin. Durability. Any Bitcoin or Satoshi can be reused countless times without degrading. Recognizability. A growing number of merchants and users recognize and accept Bitcoins. Although it’s still far from the level of acceptance of fiat currencies, many people distinguish Bitcoin from non-currencies or other counterfeit money and are willing to accept it as a means of payment. Decentralization. No single entity oversees Bitcoin. Unlike traditional money, no one can censor, control, or change the network or its transactions, so that no one can confiscate your money. Accessibility. You don’t need to have a verified bank account to own or accept Bitcoins. All you need is some basic computer knowledge and an internet connection. Bitcoin's accessibility makes it extremely convenient for underbanked areas of the world. Uncounterfeitability. Every Bitcoin transaction is recorded on a distributed ledger and is secured by the computation work of nodes. The system was designed to prevent the double spend problem which hindered preceding digital currencies from taking off. As a result, all transactions on the Bitcoin network are uncounterfeitable and irrevocable. Programmability. Unlike regular money, Bitcoin also introduces a dimension of programmability. It means that in the future, Bitcoin can receive updates and have even more handy features like smart contracts, multisig transactions, and others. Stability and store of value. The only feature which is still somewhat lacking is Bitcoin price stability. Because of volatility, Bitcoin is used more like a commodity such as gold. However, that is likely to change when Bitcoin gains more adoption, and there are fewer incentives to speculate it. Until the widespread adoption of cryptocurrencies, Bitcoin is expected to remain somewhat volatile. 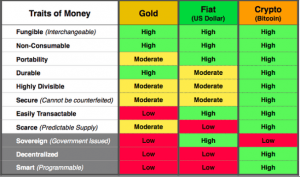 Bitcoin qualities compared with other currencies. The most important reason for the current Bitcoin value is that people want to use it to pay for goods and services, store their money, or merely speculate. The more the network of Bitcoin users and merchants grows, and the more secure and advanced the system becomes, the bigger Bitcoin’s value in USD and other currencies can get. Next - How is the price of bitcoins set?